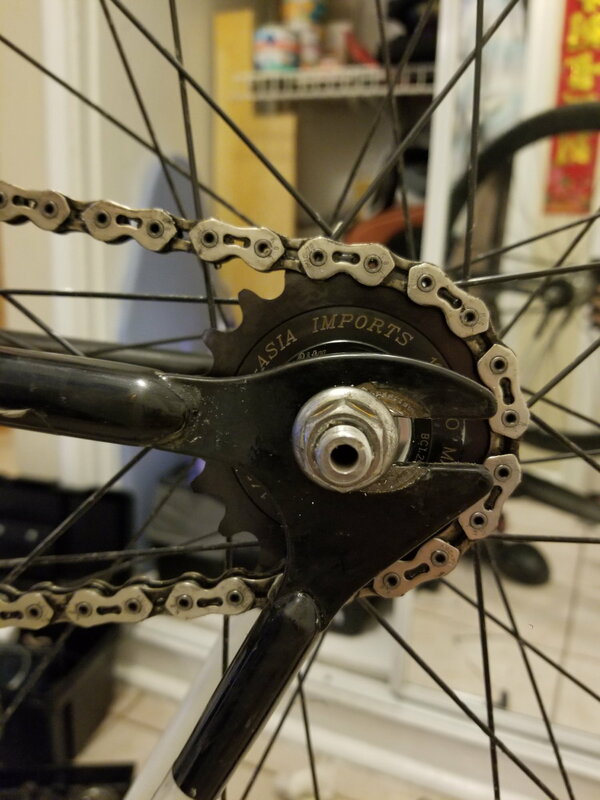 If I leave the chain its current length, I have to completely slam the rear wheel into the dropouts and break the chain in order to get the wheel on and off when using the 19T cog. Both not exactly ideal scenarios as I would like to be able to use both cogs interchangeably without switching chains. Which is the better option? Slammed 19T or 17T way in the ends of the dropouts? Also, I definitely think a half-link would be perfect in this situation. Does anybody know where I could find a half-link compatible with a KMC K710SL chain? Definitely don't go the slammed wheel route, breaking a chain just to change a flat is more work than it's worth. With the extra link added and using the 17t cog you don't need to have it backed out that far. Looks like you could scoot the wheel forward and have a little slack in the chain. breaking a chain just to change a flat is more work than it's worth. I was thinking the same thing. Plus I'm using the 19T for the winter when I also have larger tires. I really didn't the like the prospect of a few mm of clearance between the tire and the seat tube on a snowy and icy day. Last edited by PeopleAreIdiots; 02-09-19 at 02:39 AM. Every winter, I not only flip my wheel around to use the bigger cog, but swap to a smaller chainring. By losing 3 teeth in front and gaining 3 teeth in rear, I'm able to use the same chain throughout the year without changing the axle position. It works for me, but I could understand that being too much futzing for some people. You could also get dedicated summer and winter chains that are allowed to be different lengths. If I went down a few teeth on the chainring I think that might effect my gear ratio too much for my liking though. For reference, my summer setup is 46-17 which equates to around 72 gear inches. For winter I'm using 46-19 which is around 64. 42-19 or 44-19 would get me down to like 60 which might be a bit too low for my taste. I decided to go for the longer chain setup for now and I am really liking the 46-19 ratio with my fatter winter tires. What Ill probably do is either use dedicated summer and winter chains like you said, or get a half-link chain like the KMC HL710 that will allow me to fine tune the chain length more. If you go to dedicated chains, a half-link chain is probably overkill to get the right length(s). Track ends like yours allow a lot of adjustment. I'm not sure I'd worry about the place of the wheel bolts as long as it is in the dropouts. 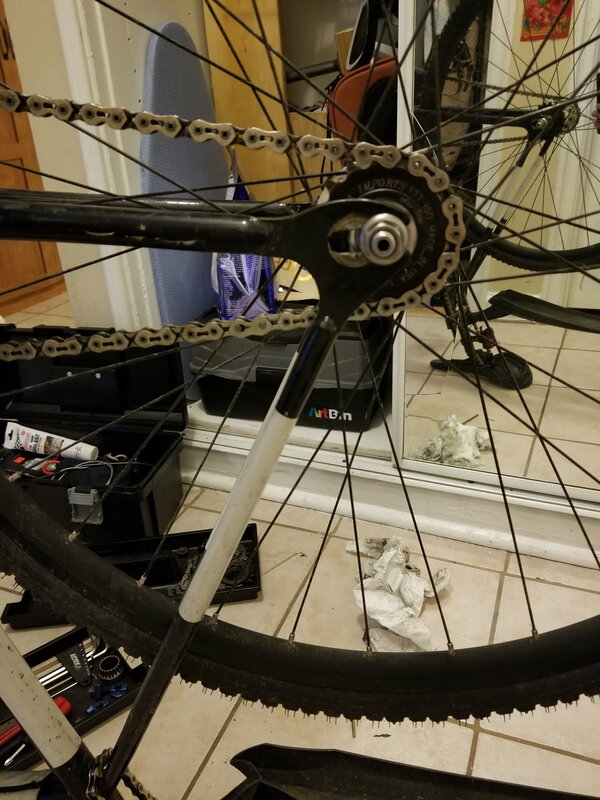 If the chain stretches, say 1/2", then that will push your wheel back just under 1/4", and you will be close to being too far back (but then it will be time to change your chain. As @hardboiled718 mentioned, getting the wheel off to fix flats will be important. KMC does sell 1/8" half-links that should work. It won't mach perfectly, but as long as you keep pedaling, nobody will notice. Ah, cheap. I like it. They don't make a silver one? Assuming you don't want galvanized. You could, of course, break up the half-link chain, and have over a hundred of the half-links for dirt cheap. Then, get a bunch of the "bullet pins". Thanks a bunch! I was having a hard time finding it. I noticed you sent european links, maybe theyre harder to come by in the usa? https://www.kmcchain.com seems to be in Chinese. The English version appears to be the .eu site. With the part number, you should be able to order the part, although the black links seem more common than the silver ones. If you chew through enough chains, I'd be tempted to hunt down a half-link chain + a bunch of chain pins. But, say 2 chains a year... 100 links, that could last you 50 years. cant decide if i love it or hate it. Bit pricy though. Last edited by PeopleAreIdiots; 02-11-19 at 12:22 PM. Perhaps the color of that single half-link won't make a big difference. It will be easier to find on the chain. But, it is odd, the selection. This one comes with the silver half link as part of the chain, which would just seem natural as part of the design of the single-speed chains. Of course, you were using the "super-light" version of the chain. I think I'd still tend to buy the half-link chain, and start whittling off pieces. Or... how much do you have to shorten your chains? Perhaps use the half-link chain, and re-use all the extra half-links. That's not an entire half-link chain, it's a bulk package of half-links. Last edited by phobus; 02-11-19 at 02:55 PM. Half-link chains are known to elongate quicker than full-link chains, that's why I recommend against if you don't need one. I supposed it's worth mentioning that I think this is completely fine. The nut is totally captured by the track end, and you've got a long ways to go before the axle can fall out. Odd, the number of pins is the same, as well as the basic pin design. I've wondered for some time of the "stretching" of chains was actually occurring in the chain plates rather than at the pins, especially in multi-speed bikes. So, I could imagine the shaped half-link plates would be at greater risk for stretching. It's not a big mystery in this case. With a full-link chain, the pin-to-pin spacing is fixed for each outer link. No matter how much the pins and bushings wear, the two pins for each outer link will never get further apart. So all of the elongation you see is the slop that allows the inner links to migrate outward from each outer link. With a half-link chain, you get that migration in both directions at every single pin, so the elongation adds up twice as fast. At least, that's my understanding. I'd be surprised if plate deformation played more than an infinitesimal role in all of this. I think I'd still tend to buy the half-link chain, and start whittling off pieces. yeah that might be my easiest option if I want to keep using my current chain, which I do kinda like. Here's a question from a relatively inexperienced bike mechanic: when I'm breaking a chain, can I not just reuse those extra links no problem? How come I need these bullet pins you linked to? Maybe its OCD on my part, but would you want to ride that? It just feels a bit icky to me. But hey, I'm the one asking you guys. Last edited by PeopleAreIdiots; 02-11-19 at 04:52 PM. The thing is that every pin has an inner connection and an outer connection, whether one is using half-links, or normal links. So, a 100 link chain will have 100 outside connections, and 100 inside connections, no matter whether it is made up of 100 full links, or 100 half links. I've seen images on the web about chain pins with deep notches. But, I've felt some of my pins that I've removed, and they still seem smooth. Perhaps I'll have to look a bit closer at how the pins fit into the inner links. You probably don't need 'Em. However, the vintage chains had essentially round cylinders pushed into the plates. (or the hollow cylinders used in your Super-Light chains), and held in place with friction (and a little pin sticking out). With the advent of 9/10/11 speed chains, companies started mushrooming the ends of the chain pins. When you press out a mushroomed head, a ring of steel breaks off. Push the pin back in, and you no longer have that ring of steel, and even worse, the end may be tapered from where the ring broke off, or the plate may be slightly enlarged from pushing the mushroomed pin through. There likely is little need to mushroom the pins on 1/8" chain, especially for the casual non-racing users. However, looking at the KMC website, it looks like half of their 1/8" chain pins are mushroomed, and half are not. So, the answer really depends on what you actually have on your chain. In theory, one can 100% remove a pin, and push it back in. But most amateur mechanics have learned that it is a pain to push a pin back in that was fully removed. And, one takes care to only push the pins out 90% of the way (and wiggle the chain slightly to get it loose). The new "Bullet Pins" are designed for easy installation. I'm not seeing a lot of notes on sizes. They should be listed for 1/8, 3/32, 9spd, 10spd, 11spd. As far as I can tell, the KMC Bullet Pins that I'm seeing are all for the 1/8 chain. Interesting, looking at the KMC site. Some of the 1/8" chains appear to have full bushings, rather than the pressed half bushings that have been common on chains in the last few decades. One gets lost in their wear estimates for each chain design. BTW: I got the .com page working. Don't know why it wasn't working earlier. This is your half link. Some items have a buy link, not others. Product numbers seem to vary slightly between websites. Really appreciate all the info! Thanks! I mean you're right this is exactly what I'm looking for. Now kmc just needs to take my money and give me one. I followed the link on the .com website to the "global store" where they then link to the .us and .eu stores. The .us site doesnt seem to sell these individual half links while the european one does. so I guess us north americans have to just buy a whole half link chain just to use one link, huh? Cool kmc... cool. Last edited by PeopleAreIdiots; 02-11-19 at 07:08 PM.